We use water every day. We shower, we drink water, we flush our toilets and we water our lawns. Cities require proper infrastructure to transport clean water to all buildings and to remove the wastewater. Water is not an infinite resource. There are many places in the world where large populations do not have access to clean drinking water. Sustainable urban planning and architecture introduces ways of conserving our clean water, reusing grey water and decreasing the amount of wastewater that goes into our cities’ sewers. Sustainable architecture can contribute to water conservation by collecting, storing and recycling rainwater. The water stored can be used for irrigation as well as in toilets in order to save clean water for drinking and washing. Imagine how much water could be saved! 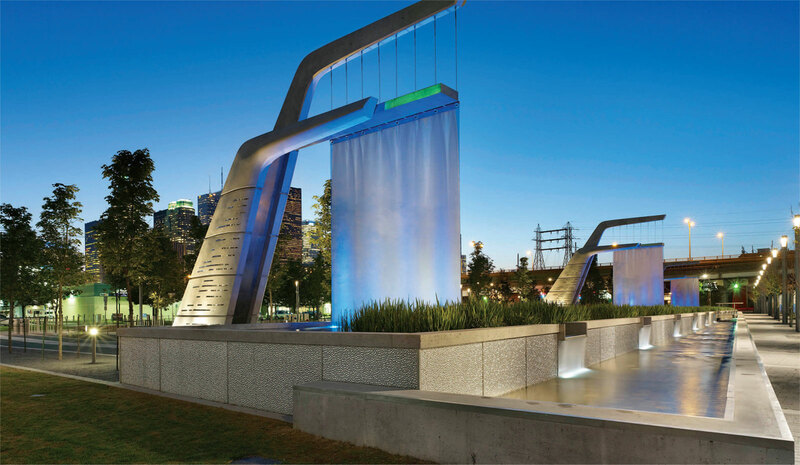 Architects have integrated interesting rainwater collection apparatuses that collect water into their designs. Grey water recycling is another way that we can conserve water. Grey water is any wastewater from our taps that does not include toilet water. There are building methods that can be used to divert this wastewater and store it so that it can later be used to irrigate lawns. Cities use natural resources to deal with large amounts of waste and rainwater. Green roofs help absorb rainwater and reduce runoff; thus, conserving energy. Permeable paving systems, including: gravel, interlocking brick pavers and dirt also allow water to absorb back into the earth, rather than overwhelming the storm sewers.